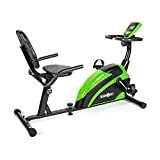 The Klarfit Relaxbike 5G Recumbent Bike is designed for a targeted and effective training, regardless of the weather, to increase stamina, strengthen the leg muscles, and improve general fitness. stopping annoying noises while you train. Bottom rollers move the unit to your preferred training location with minimal effort. The level of athletic challenge can be flexibly adjusted in 8 steps. The pulse sensor feeds the console with your live training data to monitor and measure your heart rate, thus allowing for efficient power control. In addition to the pulse frequency, the clear LCD display on the Klarfit seat ergometer displays the time, speed, calories burned and distance.